Comedienne Helen Lederer takes on comedian Bobby Davro. Presenter Tim Wonnacott oversees as they hunt for bargains in high class Chelsea. Browse content similar to Helen Lederer and Bobby Davro. Check below for episodes and series from the same categories and more! Welcome to the show, bargain hunters. Were you fooled? Did you think it was somebody else? Today, the celebrities are all comics and mimics, so you'd better keep a close eye on proceedings. But remember, there's only one Tim Wonnacott and one Bargain Hunt! from Antiquarius in the swinging Kings Road in London! and find three of the most impressionable items. They'll take their buys to auction with a view to making some money. Any profit that they make, they get to keep, so let's meet the first of today's teams. For the Red Team, we have actress, comedian, writer, presenter and wine expert, Helen Lederer. from Naked Video to Absolutely Fabulous. And chairs I thought might be quite interesting. I've got a friend with a shop with some lovely chairs in it. -Yes. And she believes chairs are as important to civilisation as a masterpiece. but will she have the taste for a good bargain? She's brought sister Jan along to keep her on track. Helen, what does it feel like coming on a game show, not a comedy show? -I haven't experienced it yet. There'll be less humour. because Jan is sensible and she'll keep me from going mad. -Are you likely to do that? -Yes, I get excited when I see things and I haven't done this before. -I've got to have the voice of reason. I like glasses because I have a little interest in wine - drinking and writing about it a bit. I love the way glasses twinkle in the candlelight. And jewellery and I like paintings as well. -Jan, has your sister always been the entertainer in the family? She insisted on being the star turn. When we put plays on, I was the compere. -You did all the hard work. -She was the main act. -You've got an interest in the arts? -I'm in NADFAS, an Association of Decorative and Fine Arts Societies. We get to have lectures every month and visit stately homes. -I'm not surprised you brought your sister. -What are you going to do, Helen? I'll just be looking at things and making the decisions. And she'll just be saying, "No..."
-We don't agree on anything. You'll get on terribly well on Bargain Hunt. Anyway, let's see who they're up against. For the Blue Team, we have actor, comedian and all-round entertainer, Bobby Davro. Bobby is one of the UK's most popular pantomime stars and has been in many sketch and talent shows. He got his first serious acting role in EastEnders as Vinnie Monks. -No, some idiot's just tried to knock me over! -I'm afraid I'm that idiot! He's left Albert Square, but can he keep a straight face when it comes to playing the Bargain Hunt game? He's brought girlfriend Vicky along to help. -Welcome to Bargain Hunt. Bobby, what do you know about this bargain hunting lark? That's why I've brought Vicky. She'll buy anything that is marked down. She came home the other day with an escalator! -Brilliant. Tell us about Vicky. -This is my future ex-wife. -We are going to endeavour to get a few bargains and win. -Why is Vicky the best person to help you today? -She's got an eye for a bargain. -What sort of things will you be looking for? -Something cheap. That's what she sees in me! -I like quirky. Small and interesting. -Vicky, should your expert be worried? -What do YOU think? He's probably shaking behind the scenes! -All this business is no mystery to you because you come from a showbiz family. -My mother is one of The Beverley Sisters. -My father was the footballer Billy Wright. I'm very proud of that. -The man with 100 caps? -So I've got to do them proud and win. -Very. Dad said, "Always play to win." With that sporting and celeb lineage, I think you'll do terribly well. So are you scared, Reds? I'm a little scared, but we're fighting fit, aren't we? -May the best team win. £300 apiece. There's your £300. You know the rules. Your expert awaits. And off you go. Off you go! So which team is going to make the biggest impression on me? This is no laughing matter! They're playing for profits, not laughs, so we've provided an expert for each team. For the Reds, it should be James Braxton. For the Blues, isn't it Charles Hanson? Eh? Enough fooling around! It's time to shop and James is getting some clues from the Reds. Now, team talk before we hit Antiquarius. What would you like to try and buy? It'll be different, whatever we decide. I like pretty things. -I'd go for more things that you use, decorative, in the house. -But not utensils, not saucepans. So have the Blues started shopping? Hang on, I've just seen something. -We think it's very pretty. -Can I pick it up? -I have no idea what this is. -You said sweets and nuts and things. -It's a sweet and nut basket! It's what we call a bonbon dish. -In the elegant times of the Georgian period, 1820s, 1830s, at the dining table. The oval outline, very classical. It's delightful. -I like it cos it has a practical use as well. -Let's do it. Let's buy it. -How much is it though? it's worth between £100 and £150. It ought to make 150. -Can we get it cheaper? -Shall we go for this? -I think we should, don't you? -It's a lovely piece. It's gorgeous. They might need some bonne chance with the bonbon dish. -Here we are, two birds. -What are they made of? It'd be lovely if they were silver, but they're a base metal. -It's a combination of brass and tin which is then gilded. -I wouldn't be drawn to them, but what about you? I think you see them on side tables or dining tables in country houses. And table centres, long tradition of them, those early Meissen figures. -They were not destined for the cabinet, but for the table. I think the bases, it's a very Regency, early 19th century look, that oval disc. -And people aspire to that? -No, these are little elements that help you date things. -So I would say that's about 1840. -That's true and that's authentic and what do you think? -Do you think we'll make money on them? I think we could. That's why I'm leading you here. I don't want to sell you a pup. -OK, you're on. This is you. I don't know. James is thinking of the country hunting and shooting set that I don't mix with. Looks like two birds in the hand are worth, well, £40. -Bobby, you mentioned that you were interested in fishing. I wonder what you think about these collectables? This is a solid silver box, got a hallmark inside for London 1908.
then engraved underneath and coloured we've got a leaping fish. -That's very clever. It gives it like a 3D effect. -So that's one alternative fishing collectable. -A nice item. Something like that is worth £1,200 or £1,300. I wonder what sort of person owned this and how did he value it? Once upon a time, this is the handle from a corkscrew. -You'd have a helix down here and pull your cork out of the bottle. I can't understand why unless that had been broken. But now that it sits on a stand, you could have that on a desk. This little fish might be something that you'd catch. -It's a ray, member of the shark family, I think. -I wouldn't know, but it says something on the back. -Yes, probably to illustrate a book on fishing. When they printed the book, they sold the watercolours. Original watercolours of fish are quite rare. Because of the subject matter, that might be worth £300. your parents, your mother and your aunt, you kept a certain amount of material from those days? The nostalgic thing that we've got does relate to them. We've got this wonderful billboard poster when they topped the bill. -The names beneath them - Morecambe and Wise, Harry Worth. -But your mother and aunts are at the top! particularly if you can drill down to the original source. It's a great piece of social history. -And your mother and her sisters were great stars. -I wouldn't let any of these go. -I'm glad you like the fish. I think this is stunning. Not the normal choice of a bargain hunter - jewellery. It's plain, sophisticated. I would have this. Wouldn't you? It's very like the one you bought me to wear at your wedding, so I see why you've gone for it. -It has a star element. -Do you think? A star? You go like this and you wear your black evening dress. -It goes flat on your neck. -It is the right sort of length. -Is it gold, silver, brass? -I don't know. I think I've got a very good price for it. -It would be lovely if it was gold. Not normal marks. It would be lovely if it was gold. Let's say it's silver gilt. If that was gold, it would be £600 or £800. -140. That seems great value to me. -It's priced to be silver gilt. -I think turn of the century, so 1900, 1910. -If you're gonna go for jewellery, this is the one. -You did get it down a lot. I'll just do that. OK. Let's go. Later at auction, the teams will do something that they never normally do - give me a straight answer. Because this is no joking matter. The experts will spend any leftover lolly on a bonus buy designed to boost the team's profits at auction. But the experts could buy a right turkey which loses them money. Helen and Bobby are not gonna find that a laughing matter. Time to catch up with those naughty blues. -You just want to get under that duvet. It says, "Love me, love my dog. -That comes off, does it? -Do you want to pull it off? -The little doggie cuddling in! I think that's so charming. Is that ridiculous? -Bit cuter than my one. -The good news is we can have it for 25. That's really good. -It's what we call "decorative" on the market. -Yes, I go with Charles here. -It's only 25. That fits in with the budget. -I can go with that. -I'd better go before I get into hot water. -Thanks, Tim. I don't think he liked it. -I'm willing to take the risk. -It goes with our team colours. -Shall we go and pay for it? Vicky certainly wanted it and paid the full £25. I need to talk booze with Helen. -Helen, you're passionate about wine and you've brought me something to look at. -What do you know about this thing? -This is beautiful and it was in our drinks cabinet. In the '50s and '60s, people had drinks cabinets. That's a clue, not that you need any! But bottle of wine goes in. I inherited it from my parents. I think it came from the father's side which was Czechoslovakian. If we turn it upside down, it's got some marks on it. They're like British hallmarks, except they're strictly regulated. These Central Europeans also marked it, but not necessarily in a strict order. One says this is silver, the other tells you the town, year and maker. -It's posh, sort of upper class? In the middle is a crest and that could be researched. It's a neoclassical piece of silver. I bet you a quid it was made between the 1770s and the 1790s. -But nothing to do with wine. A bottle can go in it. Once upon a time, it had a glass liner and I think it's a very, very smart bonbon dish. It would've been passed around an 18th century dining table. I've brought a few wine-related objects cos you write about wine. -Any particular piece you fancy? -Is that jewellery for bottles? I've never thought about these as being bits of jewellery for bottles, but you put this around the neck. The idea is it tells you what's inside the bottle. These labels are great collectables. This is a Victorian one. We've got brandy and port Georgian ones there. These are probably worth £100 each, £80 to £120. -My eye was drawn to this little cup just because it looks so lovely. -It must have a function. You'll tell me what it is. -It looks like a cup. You pick it up and, halfway down it, the bottom isn't at the bottom, the bottom is halfway up. It's a measure. You have twice as much in there as you've got in there. But not expensive - £60. I'd have to go with the bigger measurement as an estimate. Helen is happy, but why is Bobby on his own? -I think I might have discovered something. -They say small is beautiful, don't they? -I don't know what it is, but I've bought it. -I knocked it down a bit - 150 quid. First and foremost, it's very novel. It's quite weighty, which is a good sign. -And the decoration is really well detailed. You've certainly bought quality. What we've got is an Austrian bronze ornament. On the base, we've got the all-important Franz Bergmann mark. -And Bergmann in the 1880s, 1890s were making these in Vienna. And it has a really sentimental subject. It's fantastic quality. It would've been hung for vestas, for matches. -It's got a little hole in there. -I looked everywhere for something. -Is that the best you can do? -No, it's lovely. Go on. -You've bought it, haven't you, now? It's got great charm. Cat and dog lovers, yes, please. Franz Bergmann lovers, yes, please. -Got lots of pluses then. -Today, in a saleroom, it could make £200. On a bad day, it could make 120, 130, but it's certainly worth around the figure you paid, at auction. I'll be back in a sec, all right? Maybe Bobby should stick with his team next time. -You see, I like this. -I'm gonna let you squirm a little longer. Lordy, lordy, lordy! -She's on her own here. -Are we gonna be bulldozed again? -This is a pretty thing. It's got a bird in it. -That could be attractive as a mini item or a present for someone. We've got to ascertain whether it's a print or an original work first. -Go on, get your monocle out. What say you? It's well made. -I still don't like it. -I can't see a signature. It's very sort of chintzy, isn't it? -If you wanted a little photo frame, this is stand-alone. -And there are lots of bird lovers out there. -It doesn't do anything for me. -Hit us with it. Is it £30? -I haven't got my glasses. Can you say the words? -There is no nice way of saying that. -Get it down. You'll have to peck at that price. Sorry, whatever you both say, I'm having it, all right? This is the one. Thank you. Hello, I'm Tim Wonnacott and if you don't like me, you can shove off! Oi, I've told you! No impressions. There's only one genuine Tim Wonnacott. That's what I call an antique. That's charming! Let's recap on what those Reds bought. I saw some nice things and some things I could pass on. Jan and James got things off to a flying start with the partridges. Helen conceded and they paid £40. Helen put her foot down and bought some bling - a fancy necklace. I wouldn't have bought jewellery, but there were great pieces. I have a nose for these things. and paid £60, but can the girls agree about their items? -Your stuff is a bit glitzy. -Yeah, I think things should be noticed. -Therein lies the difference between us! Helen and Jan... Which is your favourite piece, Helen? -My favourite is the necklace, undoubtedly. -You're really hot on those birds. Overall, you spent £240, which means there is £60 of leftover lolly. -It goes to my old mate J Braxton. -What will you do with that? -I'm spoilt for choice. The Faberge is probably out. -The block crystal is probably out, but the spelter may be there. Not really! Oh, we can't wait, James. Anyway, very good luck. Let's remind ourselves what the Blues bought. -I'm very happy with what we've got. -We've chosen three nice objects. -The little chocolate boat was nice. I think they mean the silver-plated bonbon dish. when Bobby bought the milk churn. Charles really liked that. My favourite item was the little bed. -I'm not sure. But who will win at the auction? Yes, we're going to beat those Reds. Bring it on, Helen! So, you two lovebirds, did you enjoy your shop up? -We had a lovely time. So sweet. I'm so proud of you two cos you spent £295. Nobody spends that much! Charles, here we are in London in the premier shopping area for antiques. What will you do with £5? It's pennies! I'll get something original and in vogue with Bobby. -What, for only a £5 note? Anyway, it's time for us to head off to the auction. -Are the Reds in shock? I think we've pitched it wrong. We've got the wrong items. And what mischief is Davro getting into? It's great to be at Chiswick Auctions in West London with my old mate Tom Keane. How are you? their first item is this pair of partridges. -How do you find these two old birds? -Really good quality. It's a shame about the silver plate being worn. -Do you think they might be Japanese? The metalwork is fantastic. What might they make? -They should make between £100 and £200. -James Braxton found these and he paid £40 for them. Brilliant. £100 to £200. Good luck, Tom. Next up for them is this so-called Etruscan necklace. There was a bit of doubt as to what this thing is made of. I tested it. At first, I thought it could be Indian gold, 24-carat. We put acid on it and it didn't test as gold. We scratched it, the metal underneath, possibly silver gilt. -But it's just a base metal. -Which is really bad news cos they paid £140 for that. How do you value that, just as a decorative necklace? -£25 to £45, that sort of money. -You're going to be giving with one hand and taking away with the other. -The little miniature frame, what do you make of that? -Not my cup of tea. and planted in there, so I don't think they started life together. -Normally, you have a portrait of a relation. -Not some little bird like that. -What's your estimate on that? They're not too shy on that one because they paid £60, so they're just in your fairly broad estimate. I guess they'll need their bonus buy. which hopefully is gonna make you a profit at the auction. Don't look so wincey about it! James will reveal it now. -Have I used it responsibly, the £60, or has it been squandered? -It's rather attractive. He's not quite all there. -You've spent £60 on something that isn't all there? Are dogs popular? It's not horrible. Is it nice? D'you know, I don't know! -Did you spend all the money on it? -I did. It's heavy. It's a sort of bronze spelter. You don't have to decide right now. You decide after the sale of your first three items. Decision time happens then. But for the viewers at home, let's find out what the auctioneer thinks about it. -How do old dogs go at Chiswick Auctions? -It's poor quality, turn of the last century, spelter. -Yes. Difficult thing to sell? -30, 40 quid on a good day. -On a bad day, a £10 note? James Braxton paid 60 smackers for this. Thanks, Tom. Now for the Blues. Bobby Davro and partner Vicky, their first item is the bonbon basket. -It's nice quality, it's period. It says underneath "silver-edged". -It's not a confidence-inspiring inscription, is it? -Which edge? If it was silver, it would be £300 to £500. -In silver plate, what's it worth? -That doesn't sound so brilliant. -Hard work for you, I'm afraid! Next is Bobby's choice, the novelty, cold-painted bronze milk churn. -It's a sweet little, wacky collectable. But someone's taken the paint off. They're gonna struggle with this. It's the stripped paint that brings the value back. Sometimes Bergmann bronzes can make a lot of money. Signed Bergmann would make £300 or £400. That's an unknown maker, Vienna factory. -How much do you reckon that's worth? -If we're lucky, £70 to £100. -£150 paid. Bobby went bonkers on that. -I'm in the wrong game. I should be selling things. Lastly, Vicky's choice is a little novelty piece of ceramics. -I'd say a pound or two. But as an auction room, we don't take bids under £10, so that's £10 to £20. -It's a bit of a good day type scenario. Now, Tom is never scathing about anybody's goods. and you've just about said it all in the nicest possible way. I have a funny feeling this Blue Team are definitely gonna need their bonus buy. Let's have a look. leaving a miserable £5 note for Carlos to go out and find your bonus buy. Show us how you got on. -It was tough and, thinking of my team, I found this. -Let me explain. I was desperate. I thought, "What's left over in the antiques fair?" And I bought it. -That's why you're not wearing a fleece. -I can see this moving well in the sale. -I'll sign it as well to give it added value. In several hundred programmes, this has never happened! I think it's a perfectly reasonable thing to allow, don't you, audience? Nod if you agree. Let's find out what the auctioneer thinks about this wacky behaviour. This is really wacky, Tom. Charles Hanson only had a £5 note to spend on his bonus buy. He couldn't find anything in the fair, so what he did was to do a deal with Bobby. That's Bobby's fleece and he paid Bobby £5 for it, which is a bit naughty, but we'll bend the rules. -And your job is to sell it. -I've got a chance of selling that, compared to some other items. -They've done a good strategy? -I'll get £20 or £30 for that. -Will you give them the option of Bobby signing it? -Hopefully, he'll sign it. It might increase the price. That would be brilliant. We're looking forward to it. Thank you. Now then, how are you feeling? -What have you got to be nervous about? -I just feel that we might have got it wrong. -I think we've pitched it wrong and got the wrong items. -I'm about to blame James for everything. -James is not looking concerned...at all. First up, it's going to be those little birds. The auctioneer has estimated £100 to £200 on them. How good is that? If they are indeed partridges. They might be quail. But you have every prospect of making a profit on them. -Pair of 19th century, silver-plated quails. They're worth £100. £100? £50? Start me somewhere? £40? I'm bid £40. I'll take 2? 42. 45. 48. 50. 55. 60. 65. 70. I'll take 90? Are you out at 85? Last chance, it goes at 85... Gone! He's sold it at £85. You've made £45 profit. A lady's gilt metal necklace. What's it worth? £30 for it? £20 for it? I'm bid £20. £20. 22. 25. 28. 30. 32. 35. 38. 40. 42. 5? You're saying no. £70, are we done? Last chance and gone. No, £70. You've lost £70 on that. Here comes the miniature. This is a roller-coaster. Early 20th century oval watercolour of a goldfinch. Diamante frame. £50 for it? £50 for it? £30 for it? 40. 42. 45. 48. 50. 5. 60. 5? 60 bid. Take 5? At £60, are you all out? 65, back in. 70? He's sold it for £65. You made a profit of £5 on that. Very good. That's marvellous. She's got taste! -You are only minus £20. -Is that good or bad? but I have to point out you could stick at £20 or risk £60 on the spelter dog. This is a toss-up here. This is a jeopardy moment. -Do you trust the dog at £60? -We haven't got long. Do you trust that dog? -I don't trust it, but I'm gonna go with it. -Are you sure you want to do that? -That's a vote of thanks! We are going with the bonus buy for £60. Here it comes. Early 20th century figure of a dachshund. £50? Start me at £50? £30 for it? £20 for it? -Bid of £20. 22 I'll take? At £20. 22. 25. 28. 30. 32? It's your bid now at £30. I'll take 32? At £30, are we done? -Oh, dear, you're minus £30 on that. Overall, you are minus £50. I'm sorry to tell you that. -That is minus £50 overall. This is no shame because people find it very, very difficult to make a profit on Bargain Hunt. So minus £50 is not a bad score. The thing is now, don't tell the Blues a thing. When you walk out, look incredibly confident and cocky. We don't want them to get a message. You know how to do it. Now, Bobby, you really love auctions, don't you? I've never been to an auction. I had a bad experience with Vicky cos I took her to a car boot sale. She parked the car round the wrong way and sold the engine! -You've never been to an auction. -Are you an auction virgin too? -Charles, how was it then for you? -It was marvellous. We gelled well together. -You make a lovely couple. -Thank you. She's the right height. She's great to hold on to. Yeah, marvellous. Shall we talk about the shopping? Just settle down. The bonbon basket which Carlos found and you paid £120 for it, that is a really nice period piece. -It is perfectly genuine, 1780, 1790, 1800. -It's pretty and you could use it now. You could put your bonbons in it. Unfortunately, the auctioneer has only estimated £60 to £80. -Anyway, first lot up is the bonbon dish and here it comes. Sheffield plate basket, wirework, nice quality. £50 for it? £50. I'll take 2 now. 52. 55. £70, all done? It goes for 70 then. £70, that is disappointing, isn't it? That's minus £50. Here we go. Now the milk churn. 19th century Vienna bronze, a terrier chasing a cat over a milk churn. £50? -About four places! £50. 55. -105 if you like...? 105. 110? -110 if you like? £105. £105. 105, all done? £105 then, that's it. £105 - so good, Bobby. Minus £45 on that. Minus 95 overall. Now it's all down to your bed. One Mottoware group by Margaret Howard. £20 for it? Thank you. I'm bid £20. 22? At £20. I'll take 2? I'll take 2? At £20. Thank you, 22. I'm bid 35. £35, done? Last chance at £35. Thank you for the bid. -You are brilliant. £35, plus £10. Even though you've made that lovely profit of £10, you are minus £85. But you'll go with this fleece. You've got to go with the bonus buy. Lot 118, Bobby Davro's Bargain Hunt fleece jacket. And modelled as well, thank you. -I'm sure you'll sign it? Here we are, Bobby Davro's fleece jacket. -You rascal! Enough of that. Let's see what happens. Thank you. A bid at £20. At £20. 22? At £20. I'm bid 22. 25. 28. 30. 32? At £30. I'll take 2? At £30. Take 2? Give us another bid. 31? 31. 32. -33? I'll give you a pound. -All done for 32, all done...? £32, well done. Well done. £32, that means you are plus £27 on that. £27 off 85, that's a difficult piece of maths. -Is it good enough to win? -We'll have to reveal that in a minute or two. So there's a bit more tension. Don't tell the Reds how you got on. Look confident. They don't need to know your score. Go out, walk in proud. What an exciting programme we have had today! Only £8 between our teams! As you know, on Bargain Hunt, we have winners and we have runners-up. It is my sad duty to reveal today that the runners-up are...the Blues. 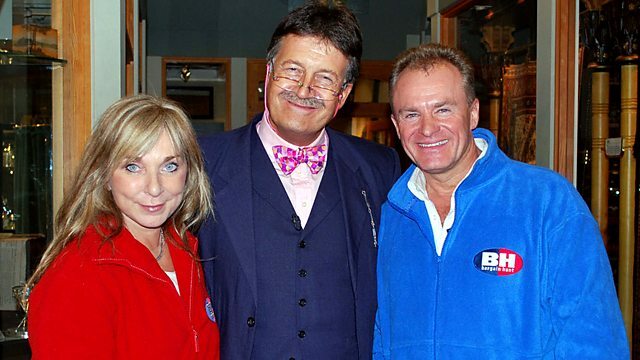 -Your Bargain Hunt fleece idea was brilliant. -I'll go home cold and broke. Your score is minus £58, but no shame in that. The victors today, the Reds... Just look at these sisters. How happy are they! That profit on the partridges, absolutely brilliant. -And you got your fiver, Helen. -I did. I'm so happy for myself and so sad for the losers! There were some profits in there, but overall the score is minus 50. We have had a brilliant programme! -I can't thank our celebrities enough. You join us soon for some more bargain hunting, yes? It's the turn of the funny guys as comedienne Helen Lederer, star of such hit series as Absolutely Fabulous and Naked Video, takes on comedian, impersonator and EastEnders actor Bobby Davro. Helen, also known as a stage actress as well as being a wine critic and writer, is accompanied in her search for bargains by her big sister Jan, while Bobby shops with his partner, Vicky, daughter of one of the Beverley Sisters and former England captain Billy Wright. Presenter Tim Wonnacott talks to Helen about wine collectables and uncovers Bobby's interest in fishing. The teams search for their bargains in high class Chelsea and Bobby gets so carried away he only leaves a modest five pounds for expert Charles Hanson to find a bonus buy with. Watch out for the cheeky surprise when the items are auctioned in Chiswick.